Educating MrMattock: Adding and Subtracting Fractions with bar models - worth sticking with. 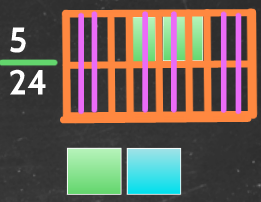 Adding and Subtracting Fractions with bar models - worth sticking with. The bar model approach to adding fractions would be thinking about how to combine these two pictures into a single picture. If we try and do this directly, this is the picture that results. Of course the problem here is that we cannot evaluate the fraction, because there are parts that are different sizes (my kids were quite happy that this wasn't 5/12). Once we have demonstrated that the major stumbling block is that the pieces in the combined picture are different sizes, the natural conclusion is that we need to adapt the original pictures so that they have the same size pieces. drawing similar pictures with the sixths makes the point that you can only create twelths, eighteenths, etc. The reason this is so important is because it allows us to justify why the lowest common denominator is useful in adding and subtracting fractions - if we need the diagrams to have the same size (and hence number of) pieces, and we can only change each diagram to have a multiple of the number of pieces it starts with, then this implies that the number of pieces each diagram should be broken into is the lowest common multiple of the two. I must admit that this took me a little while to get through with pupils, mainly because I didn't explain that crucial step properly until the third lesson when I really identified what was holding the pupils up. Once I had explained this properly, and pupils caught the concept quite quickly, everyone was ready to accept that the pictures should be changed into twenty-fourths. The thing that really struck me was that although it took 3 lessons to get through (again partly because I had to re-think my way past a wall part way through), once those 3 lessons were over a significant number of pupils understood the adding and subtracting of fractions.One girl even said "I need the diagrams" when she was still consolidating her learning. Importantly, from the vibe and atmosphere I was getting in the classroom it felt that this was a deeper understanding than just the monotonous work of a group of pupil shaped robots answering question after question requiring the addition and subtraction of fractions using a method that they honestly have no idea of why it works. Instead it felt like the pupils had begun to really appreciate how the representation of the fractions led to the need to find lowest common denominators (or at least common denominators), and how this led to the idea of multiplying both numerator and denominator by the same value (if you are slicing each piece into three smaller pieces, as in the case of the eighths above, then you are slicing all the shaded pieces into 3 smaller ones at the same time). So can I take this opportunity to urge everyone who has made it this far down the blog to try and use the visual models to really give pupils an understanding of how fraction calculations work (I am using a similar approach for multiplication next week); it may take longer, it may seem like pupils are struggling (they probably are) and it may seem like you are wasting time when you could just teach them 'a method'; but trust me if my experience is anything to go by, if you can nurse them through those struggles their appreciation and understanding of why fractions add and subtract in the way that they do will be so much greater. Shape and ratio - a nice place to mix topics.